With the temperature dropping, there's no better time to warm up your home with the season's latest looks. 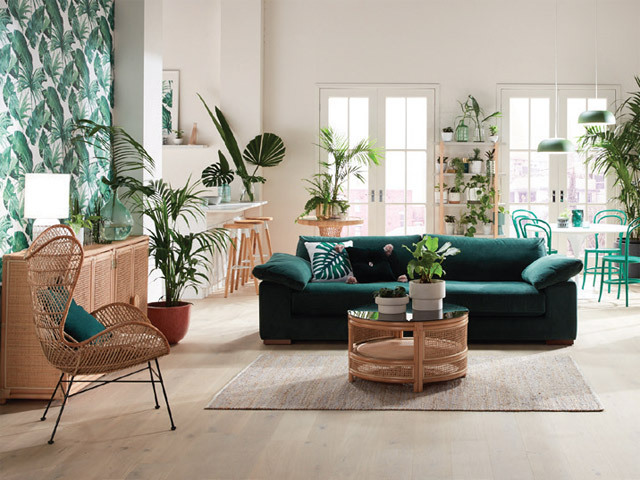 According to Darren Palmer, Carpet Court's style ambassador, two of the hottest interior trends for 2019 are the Moroccan and Botanical looks – both of which, he says, work beautifully in Australian interiors and are easy to recreate in your own home. "The Moroccan look is exotic and luxurious," says Darren. "Think bold brights, clashing patterns and earthy, rugged textures. With its bohemian edge, this look brings a sense of energy yet warmth to a space." "When you're decorating a room, it's always a good idea to start with the floor. It's one of the largest expanses of space in a home and will set the tone for the rest of your furnishings." "The Moroccan look has warm, spicy undertones and an earthy feel, so seek out flooring in a warm neutral shade with plenty of texture, such as Carpet Court's Dreamtime high-low loop pile carpet or Antilles Twist cut pile twist carpet. Timber flooring works equally well in a Moroccan scheme – again, opt for timber with warm undertones, such as Carpet Court's Stockmans Ridge Premium Spotted Gum or Blackbutt. Extra-wide boards are trending right now and will add a contemporary touch to your exotic scheme." "Complete the look with a medley of bright, patterned rugs and cushions, buffed leather accessories, decorative pendants and woven wall hangings." Another trend that translates well to Australian homes is the Botanical look, says Darren. "We're passionate about indoor-outdoor living in Australia, and this trend is all about bringing nature inside. The result is a fresh, relaxed look that's easy to love." "A pale timber floor with cool undertones such as Carpet Court's Premium Oak in Arctic White creates a soft, easy-to live- with foundation for this look and contrasts beautifully with its rich, forest greens. Or, for a sumptuous feel underfoot, opt for carpet – Carpet Court's Country Texture loop pile carpet in Blair is a textured, light neutral with flecks of colour that pick up on the tan and taupe tones in a Botanical scheme, while Wayfarer two-tone textured loop pile carpet gives you the rustic look of woven sisal, but with the softness of wool." "The key to making this look work is not to overfill the space – you want it to feel light and airy," says Darren. "Choose one or two statement features, such as an oversized leaf-print wallpaper across one wall or a forestgreen velvet sofa. Then, add in shelves and accessories in woven rattan and blonde timber, white plantation shutters from Carpet Court and plenty of greenery. Finish off with touches of gold for a modern-luxe feel." The beauty of today's flooring, says Darren, is the vast amount of options. "If you haven't shopped for flooring in a while, you'll be amazed at what's available now – there really is something for every style, budget and home set-up." With so many options, the first step is to consider how you'll use the space, he says. "Do you need something hardwearing, easy to clean, ultra-luxurious, or able to cope with the demands of children and pets? Once you've narrowed down your requirements, it's time for the fun part – choosing a flooring style that will completely transform the look of your room and home. TEXTURED APPEAL: to add texture to your interior, consider a chunky felted loop pile carpet in this season's ontrend colours – charcoal, silvery-grey or sand. FAMILY FRIENDLY: if you have children or pets, a level loop-pile carpet in a mid-tone neutral with some flecks of colour will be the most hardwearing and forgiving. FIBRE SMARTS: wool carpet has a luxurious, natural appeal, but solution-dyed nylon is a great choice if you're looking for a soft carpet with superior fade and stain-resistance for a sunny room or a home with kids. GRAB A SAMPLE: carpet and hard flooring colours will look different from the showroom once you get them home. To work out whether a colour or timber finish is right for your interior, take a sample home and look at it at different times of day and under various light conditions. CONSIDER YOUR OPTIONS: love the look of timber but want something low-maintenance and more affordable? Why not consider timber-look vinyl planks or laminate, which give you the appearance of real wood for less and can often be used in wet rooms such as bathrooms and laundries. THE TOUCH TEST: to assess how soft a carpet will feel underfoot, don't just feel it with your hands – slip off your shoes and walk on it.